The ultimate steering for high speed single outboards, SeaStar PRO®, is designed for the high speed and performance of today's topend bass boats. Recommended for single outboards up to 350 HP (even with jackplates and performance props), SeaStar PRO has steered the BASS Masters Classic® since 1994 and it's the choice of high performance outboard boatbuilders. 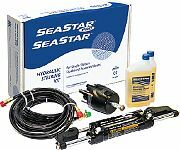 Applications: Seastar Pro is for high-performance boats with single non-power-assisted outboards up to 300 HP, especially those capable of speeds over 60 MPH, which demand maximum steering control and comfort. It is suitable for use with high-performance propellors and jack plates.